Photo: C. E. Corley House, ca. 1895, 808 South Lake Drive, Lexington, SC. Listed on the National Register of Historic Places in 1983. Photographed by user:Bill Fitzpatrick (own work), 2012, [cc-by-3.0 (creativecommons.org/licenses/by/3.0)], via Wikimedia Commons, accessed November, 2013. Lexington County Courthouse is located at 212 South Lake Drive, Lexington SC 29072; phone: 803-359-8000. Located in central South Carolina, with a 708-square mile area, Lexington County lies immediately west of the state capital of Columbia and is part of that city's Standard Metropolitan Statistical Area. Primarily because of the expansion of the Columbia urban area, Lexington has been one of the state's fastest growing counties during the past twenty years (population, 140,353: 1980 census) and has changed during this period from being predominantly rural to predominantly urban. Situated along the "fall line" dividing the coastal and piedmont areas of the state, the county is generally characterized by a gentle to moderately sloping terrain. Four rivers, the Saluda, Congaree, Broad, and North Edisto, cross or border the county. The Saluda River flows into Lake Murray, one of South Carolina's major man-made lakes. In the 18th century the Congarees, which was located along, the west bank of the Congaree River, became a major interior site for the Indian trade because of its geographic location between the often impassable river swamps of the Low country and the central rivers of the Up country. A garrisoned fort was erected at the Congarees in 1716. Domestic settlement of the area was given impetus by the royal township plan of the 1730s in which most of what is now Lexington County below the Saluda River was designated Saxe-Gotha Township, one of ten townships laid out along rivers in interior South Carolina to encourage white settlement and strengthen the province of South Carolina against both internal and external threats. The political and judicial boundaries for the area included in present-day Lexington County have changed several times since the eighteenth century. As Saxe-Gotha Township, it existed from 1768 until 1785 as the northern part of Orangeburg District, one of seven judicial districts which divided the state. In 1785 that approximate area, which had been re-named Lexington in honor of the Revolutionary War battle in Massachusetts, became one of four counties within Orangeburg District. In 1804 Lexington County was cut off from Orangeburg District and became Lexington District, with the county seat at Granby on the west bank of the Congaree River. The county seat was relocated to the town of Lexington in the center of the county around 1818. Granby, which had served as an important depot for transferring up-country produce to Charleston, had virtually disappeared by 1822. With the Constitution of 1868, South Carolina's districts were designated counties and Lexington District became Lexington County. The county lost territory when Atken County was formed in 1871 and when Calhoun County was formed in 1908. 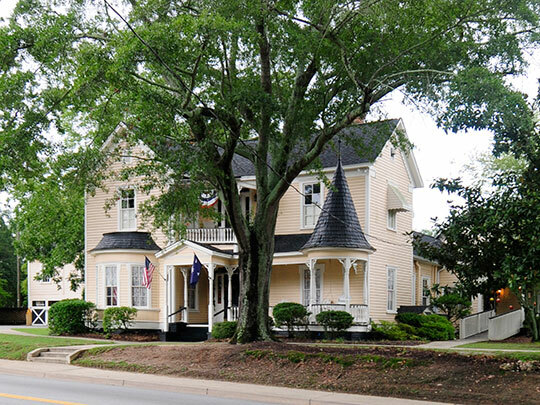 Fox, Nancy C. and Harmon, Horace E., Historic Resources of Lexington County South Carolina, 1983, National Park Service, National Register of Historic Places, Washington DC.